Service providers can be individuals, retirees, students or businesses. The Home Maintenance Referral Program sends referrals to registered providers. An application process is required to become a Life After Fifty-authorized provider. For more information about how to become a registered provider in the Home Maintenance Referral Program, call 519-254-1108 x6. ​LOOKING TO MAKE SOME EXTRA MONEY? ​WANT TO HELP A LOCAL NON-PROFIT? 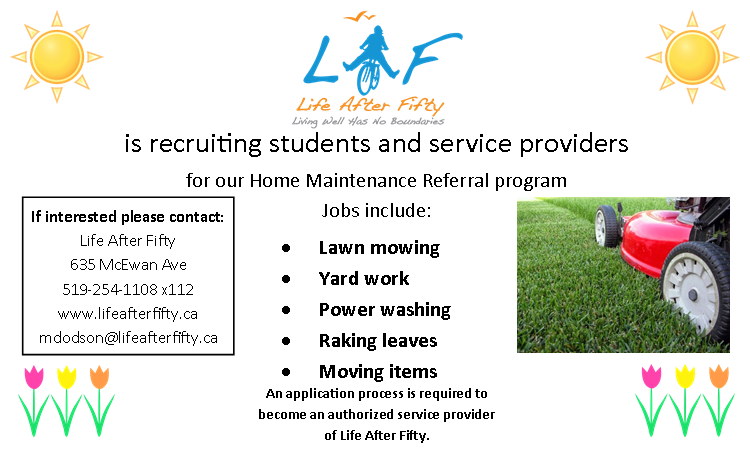 LIFE AFTER FIFTY (635 McEwan, Windsor) IS RECRUITING STUDENTS interested in earning $12/hr to shovel snow, rake leaves, and mow lawns for vulnerable seniors in our Home Maintenance Program. It’s the perfect part-time job. You run your own business and set your own hours. We send you referrals from our clients who need the service. The more positive client feedback you receive, the more referrals you will earn. You stay fit and make a little money while helping someone stay in their home. It is a win-win. An application process is required to become an authorized service provider of Life After Fifty. For more information about the Home Maintenance Program, call 519-254-1108 x6.